Winning is all the undefeated Bears know this season, but defeating the top teams in the country will be a whole new task. For a team with accomplished veterans and successful freshmen, the Bears hope to prove this weekend that they belong at the top. This weekend, the No. 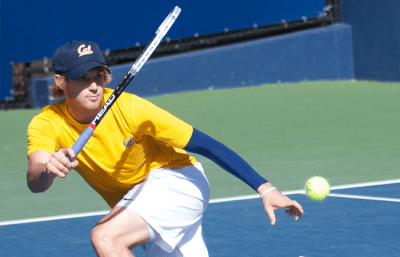 11 Cal men’s tennis team (5-0) travels to Houston to take place in the ITA National Men’s Indoor Championships, along with 15 of the top teams in the country. Its first match will take place Friday against No. 9 Mississippi State (8-0) at 4 p.m. The match will take place at the Galleria Tennis & Athletic Club, one of two locations where the tournament will be located. The winner of the match will go on to face the winner of No. 1 Virginia vs. No. 16 Notre Dame, and the losers will play in a consolation match. The event is hosted by No. 10 Texas A&M, who is also participating in the tournament along with some of Cal’s Pac-12 rivals — No. 2 UCLA and No. 3 USC. No. 1 Virginia hopes to continue its dominance at the event, being the reigning champs and having won five of the past six tournaments.The Bears have not been able to win a championship since 1990, but the team thinks that this year could be different. In anticipation of the environment, the Bears practiced in both indoor and outdoor facilities in the two-week gap between their last match and the championships. The team usually practices outdoors, but this week, they also traveled to San Francisco to prepare on indoor courts to be even more prepared for the challenge ahead. The Bears were able to reach the tournament with come-from-behind victories. Last month, they trekked to Malibu, Calif., to take place in a tournament that would determine which of four teams would earn a spot in the Championships. 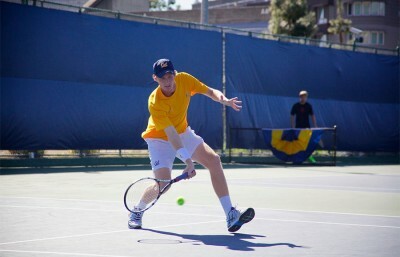 Cal first faced Alabama and, with strong play in the singles round, they defeated the Crimson Tide, 4-2. The Bears then advanced to face No.12 Pepperdine, whom they also defeated with a score of 4-2, earning them a spot in the indoor tournament. The struggles in the past matches in the doubles area of the competition has led the team to make some changes to its lineup. The matches this weekend will feature different pairs than had been seen previously this season. The No. 1 court will feature senior Ben McLachlan with Andre Goransson, the undefeated pair of juniors Gregory Bayane and Chase Melton will remain intact at the No. 2 court and at the third court will be Johnson and freshman Filip Bergevi. Having only faced one team ranked in the top 25 this season, Cal will be left to prove its undefeated record and not repeat last season’s first-round loss to Ohio State. Johnson feels that playing the top teams won’t be a problem.